CHRYSLER 300 SERIES - (V-8) - The Chrysler 300 models were distinguished by special grille, front bumper and body decoration treatments. The grille featured blacked-out finish highlighted by a full-width horizontal bar design and incorporated hidden headlights. The front bumper had long, horizontal air slots on either side of the center license plate indentation. Bright body underscores ran between the wheel openings and had long, rear extensions. Five short, slanting slashes of chrome were placed behind the front wheel openings. Three-Hundred lettering appeared on the trailing sides of the rear fender, directly in front of circular side marker lamps. New, cast metal 'road wheels' were an option introduced for Chrysler 300s this season. Standard equipment included all items found on Newport Customs, plus a 70-amp. battery; torqueflite automatic transmission: DeLuxe wheel covers; all-vinyl bucket seats with center cushion arm rest; bright metal horn blow ring and the previously mentioned hidden headlights. The base power plant for Chrysler 300s was a 440 cubic inch four-barrel V-8. The word Chrysler was placed on the right hand front edge of the hood on 300 models, instead of at the center. VEHICLE IDENTIFICATION NUMBERS: The numbering system and code locations were the same as for previous models with the second symbol changed to an 'M' to indicate a Chrysler 300 model. 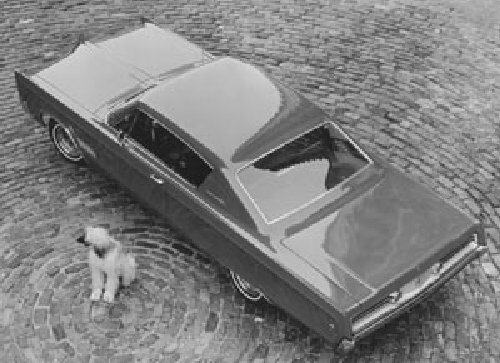 The code 'K' 440 cubic inch V-8 was the standard engine for 1968 Chrysler 300s. CHRYSLER 300 SERIES ENGINEV-8. Overhead valves. Cast iron block. Displacement: 440 cubic inches. Bore and stroke: 4.326 x 3.75 inches. Compression ratio: 10.1:1. Brake horsepower: 350 at 4400 R.P.M. Five main bearings. Hydraulic four-barrel Model R-3918A.